Dallas Bishop Edward Burns addresses the media Aug. 19, 2018, during a news conference. The Rev. Edmundo Paredes is accused of molesting teens and stealing from his parish, St. Cecilia Catholic Church in Dallas, where he had served for 27 years. The Rev. Edmundo Paredes prepares for communion June 5, 2008, at St. Cecilia Catholic Church in Dallas. Paredes, a Texas priest now accused of molesting teens and stealing from his parish, has gone missing. A Dallas priest accused of molesting teens and taking at least $60,000 from his parish now is missing, Roman Catholic Church officials said. At St. Cecilia Catholic Church, where the Rev. Edmundo Paredes had served for 27 years, parishioners said Sunday that he may have fled to his native Philippines, where he has been taking annual vacations. 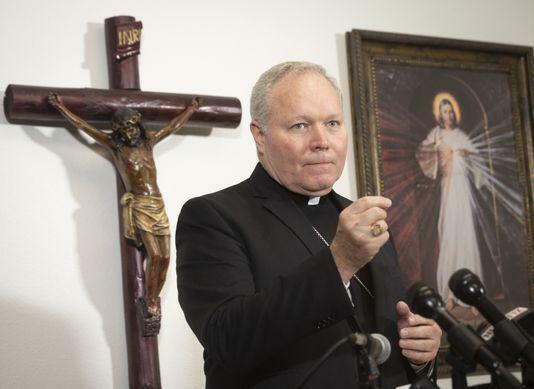 Bishop Edward Burns told parishioners over the weekend the Dallas Diocese has hired two private investigators to try to track Paredes down. "Now that we know of his criminal sexual acts, we want to get a handle on him," Burns said. The church first began investigating Paredes in May 2017 over allegations he stole $60,000 to $80,000 in cash from the parish. The priest admitted to the financial misconduct, was suspended from ministry and removed from the church in June 2017, the bishop said. St. Cecilia had a celebratory Mass for Paredes on June 1, 2017, according to a St. Cecilia Catholic School Facebook post. And another Facebook post, now not available publicly, called it a retirement celebration. But in February, church officials received allegations that Paredes had molested three teen boys more than a decade ago. Diocese officials immediately filed a report with law enforcement agencies to launch a criminal investigation, Burns said. The diocese wasn't aware of the sexual-assault allegation when Paredes was suspended, diocese spokeswoman Annette Gonzales Taylor said. "The allegations were found to be credible," Burns said. Paredes can no longer administer the sacraments or otherwise represent himself as a priest, the bishop said. Burns disclosed the allegations to parishioners Sunday after consulting with the Diocesan Review Board, a group of nonclergy Catholics who counsel the diocese on matters involving the sexual abuse of minors. The information wasn’t disclosed earlier because officials didn’t want to hinder the police investigation or compromise the victims’ identities, Gonzales Taylor said. However, after a Pennsylvania grand jury released a 1,400-page report Tuesday detailing allegations of sexual abuse against 301 priests, Burns said telling parishioners at Parades' former church was necessary. Members of the Survivors Network of those Abused by Priests contend that Burns waited too long. "Why would Bishop burns suppress this crucial information?" Lisa Kendzior and Paul Petersen, Dallas chapter leaders of the Survivors Network of those Abused by Priests, said in a statement. "Was it to protect the diocese from scandal? "What about concern for the safety of children and the need to comfort any survivors?" they asked. "Where is the transparency that the Catholic bishops promised?" After Mass on Sunday, Sylvia Segura, 61, told The Dallas Morning News that she broke down in tears because the news about Paredes caught her by surprise. When she heard the bishop's letter being read from the pulpit, Segura said she expected a statement of solidarity with the Pennsylvania grand jury report.